If you are running a publishing site in SharePoint, then you know the name Waldek Mastykarz. If you don’t, you should. His blog is filled with many posts on SEO, Content Query Web Parts, and much more. 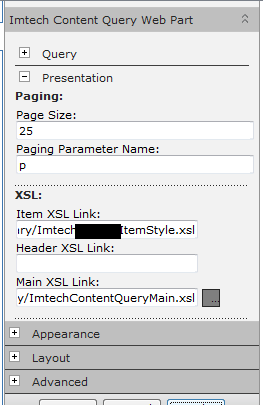 I had a client request to add some paging into the Content Query Web Part, and stumbled upon Waldek’s Imtech Content Query Web Part for SharePoint 2010. This was the perfect solution for my client, but I needed to make a few modifications… this post will go over the modifications and issues we encountered and resolved. My client had many customized item styles they still wanted to use, so using the example ImtechContentQueryMain.xsl and ImtechItemStyle.xsl sheets was out of the question, so I had to retro-fit their existing XSL files with the paging controls. The paging control appeared at the top of the CQWP, we needed it at the bottom. We encountered an error relating to trusted XSL files in a sub-site, we did not want to have duplicate XSL files all over the place. Limiting the number of records returned on large lists, so the paging controls did not stretch out the page size. To do this, I loaded up a default ItemStyle.xsl file (without any changes), as well as the ImtechItemStyle.xsl file in Beyond Compare, and copied the differences out into our custom ItemStyle.xsl. The first step, is to copy the PagingControls template into your ItemStyle.xsl – it can be placed anywhere. This adds in a parameter which gets the current position (row) from the list(s), we need this. This will call the PagingControls template we added earlier, if the $CurPos = 1 (this is the first row in our CQWP), and the $PageSize is greater than 0 (meaning that we are using the paging feature in this web part). Save your ItemStyle.xsl, and we need to next compare ImtechContentQueryMain.xsl, and ContentQueryMain.xsl. With the bolded line above being what we’ve added to it from the Imtech file. You can now save and close the ContentQueryMain.xsl file. And that is it for the modifications required on both the ItemStyle.xsl and ContentQueryMain.xsl files! You should now be able to use paging using your item styles and the Imtech Content Query Web Part. Just before the closing DIV, paste the above code back in. If you save the file (and check it in – needs to be checked in to be viewable), you will see that it appears AFTER the first row returned by the CQWP. We need to add a little logic into here so we can determine if we are on the last row, and in the case of the last page where we might not have a full page, determine what the last item number is for that last page, and then display the paging controls. So the code below would be used instead of the default we just added in here. Now, I am also going to center mine as well, so it looks a little better than just being left justified. A little explanation on the above… I’ve added 3 new variables. PageBeforeLast – this variable calculates the second to last page by taking the total number of pages NumPages, and then subtracts one. CountBeforeLastPage – this variable gets the count of items before the last page by taking the PageBeforeLast variable, and multiplying it by the PageSize, which is the count of items per page. LastPageCount – this variable gets the count of the number of items on the last page, which takes the TotalRecords variable and subtracts the CountBeforeLastPage, so if we have 23 items on the last page instead of 25, we know exactly when to implant the paging control. Now there are two if conditions after that. The first determines if we are on the last page, and the last count. If we are at the last item on the last page, we will add in the paging control. The second if statement is used for every other page but the last one. The web part references an untrusted XSL file. Now, this is in regards to the XSL options of the Presentation section of the Imtech Content Query Web Part properties. Then save the file, and you can use it by uploading it to a page, or, make it re-usable by placing it in the web part gallery of your site collection(s). This part is simple, but, I did want to include it. If you have thousands of items in a list, when you enable paging, and if you have your paging set at 25 or 50, you are going to see a lot of page numbers showing up, stretching out the width of your web part if you do not have a fixed width set… so, it does not look so great. Chances are, you do not need to show ALL of the items, just the most recent 50, 100, or a couple of hundred. The way to do this? In addition to using paging, if you limit the number of records returned within the default Content Query Web Part Properties, the only items page will be the number you are returning. Thanks for the comment Rene, glad to hear this helped you out! Great article!!! Included the paging controls in my custom ItemStyle.xsl and it works like a charm! However, I did notice that your code where you centered the paging controls generates the tags even if no paging is needed. So, I optimized it a bit and also included an extra test so the controls are only rendered when there’s > 1 page. Thanks Bart! The code did need a few improvements, but I just wanted to offer a baseline for people to use, and customize as they see fit. Glad it worked for you!